The MFTHBA Horse Show Buckle Series allows show managers to establish their own competition series designed around the needs of their competitors. Horses competing for the High Point Buckle must be registered Missouri Fox Trotting Horses. 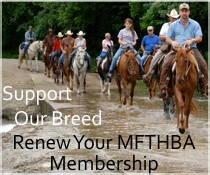 The owner and exhibitor of the horse must be current MFTHBA members. This membership must be current before any points accrued may be counted toward the high point award. Series must contain at least 3 shows. At least 1/3 of the participating shows must utilize a MFTHBA carded judge. All other requirements for the individual buckle series will be determined by the individuals requesting the buckle series.